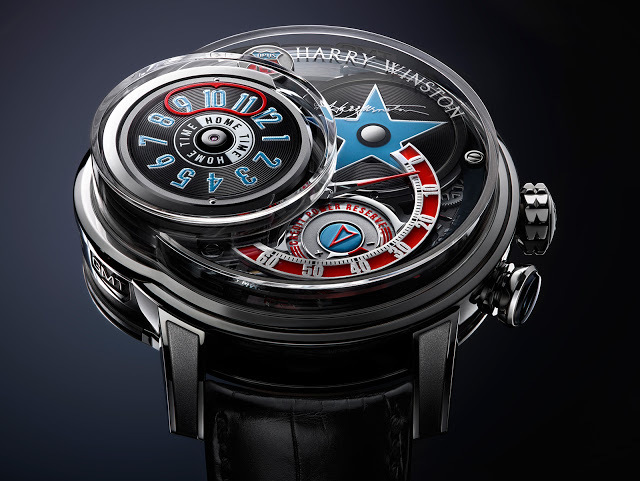 After a two year intermission, Harry Winston has returned to its signature Opus series with the Opus 14 that features a complication with retracting discs inspired by a jukebox. 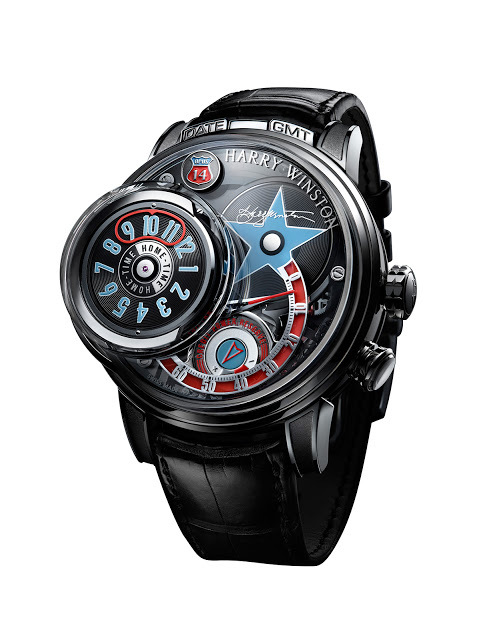 Harry Winston‘s Opus is the landmark series of complications developed by the New York jeweller in collaboration with independent watchmakers. But the last one, the Opus XIII, was introduced in 2013, leaving doubts as to the future of the series. With the launch of the impressively complex Opus 14 those doubts have been put to rest. The Opus 14 is inspired by the jukebox and 1950s Americana, featuring a dual time complication that functions exactly like a jukebox. The concept of the Opus 14 was developed by Franck Orny and Johnny Girardin, the pair of watchmakers responsible for the Montblanc Timewriter Metamorphosis wristwatch with its unusual transforming dial. The raised cylinder at nine o’clock contains four different discs, obviously inspired by a vinyl record. Topmost is the home time disc, showing the hours in the home time zone and always visible on the top. Minutes are show on a retrograde scale at four o’clock, while the power reserve is at six o’clock. 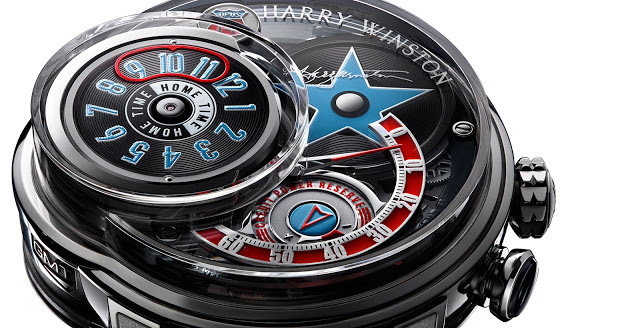 Sitting below the home time disc are additional discs for the second time zone, date and the last depicting the signature of brand founder Harry Winston. 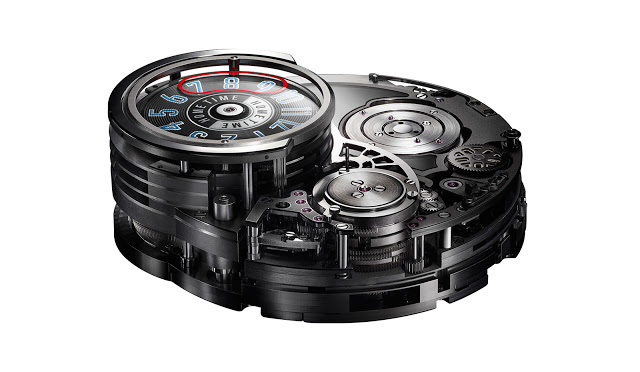 A function selector slide on the left flank of the case band allows the wearer to select which disc he desires on the dial. Once selected, the button at four o’clock brings the disc out. The disc is carried by an arm just like that on a record player, which picks up the selected disc and places it on the turntable-like platform located at two o’clock. Once placed on the platform, the disc remains until the pusher is pressed again, an action that returns the disc to the stack at nine o’clock. Though the Opus 14 has simple functions – second time zone and date – it is powered by an exceptionally complex movement. Comprised of 1066 components, the movement is has a similar part count to a grande and petit sonnerie calibre. It’s hand-wound with a 68 hour power reserve. Two mainsprings are required for its operation, one to power the timekeeping portion and the other to drive the disc display. The Opus 14 also features a silicon hairspring, the first watch in the Opus series with a silicon component. 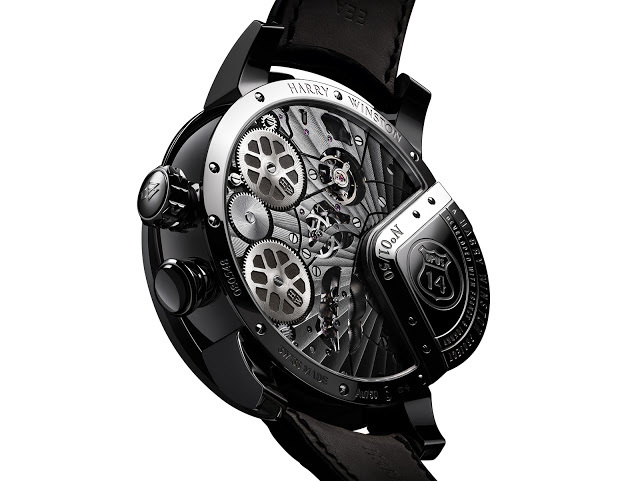 And the movement is massive, measuring 46.7mm in diameter. As a result, the watch is enormous, with the white gold case nearly 55mm in diameter and just under 22mm high. The pushers in between the lugs at 12 o’clock set the second time zone and date. Limited to just 50 pieces in white gold, the Opus 14 is priced at SFr428,000 or €410,000.